This post assume you have some experience working with URLSession and some brief knowledge on how HTTP works. This post will be focusing on multipart data content type. You might have come across scenarios where your app need to send some image data to a server API endpoint (eg: user updates profile picture). A quick search on Google / Stack Overflow will get you many answers recommending you to use Alamofire / AFNetworking, but is it really necessary to install a library just for handling image upload? What is happening under the hood of Alamofire / AFNetworking library? Some answer from Stack Overflow might contain weird looking string like \r\n--61752208 , what does this mean? 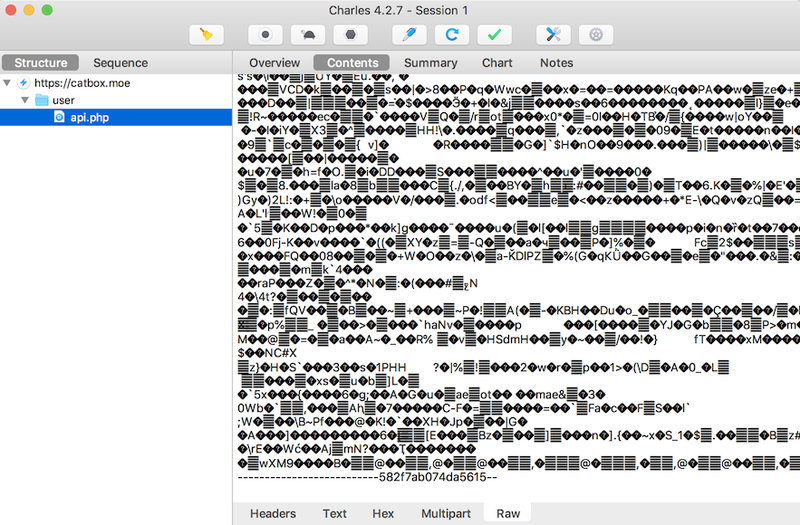 In this post, we will use Apple's own URLSession and its uploadTask to upload the image to server. We will use Catbox's free API to upload the image in this post. let url = URL(string: "http://httpbin.org/anything")! This is the HTTP request that the backend server will receive from the mobile app. To figure out how to write URLSession code which upload file and other parameters to server, we can take the raw HTTP request and reverse engineer it. In the next section we will discuss how to get the raw HTTP request. Before we start to work on the image upload code, let's take a look at how the HTTP request looks like for the file upload. cURL is bundled along the macOS, this post won't go into detail of cURL but it is a command line tool to simplify making HTTP request. 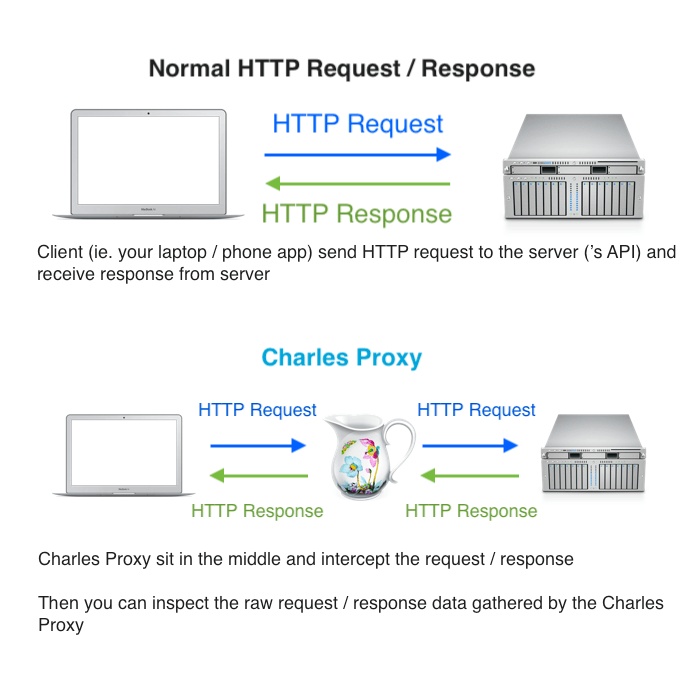 We will use Charles Proxy to sniff the HTTP request. It cost $50 but you can use its free trial version without expiry date (just a minor timer annoyance when you open the app), it will be one of the best 50 dollars you spent in your iOS dev career. You can continue reading without downloading the app as we will explain how it works below. You can change the directory to a folder with image, then replace the "@Asriel.png" to "@[Your image filename]", the @ indicates a local file. 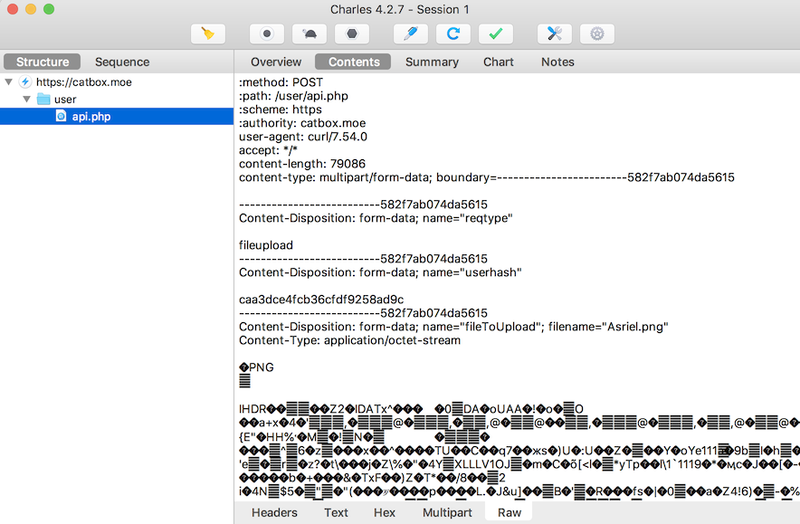 The --proxy flag is used to instruct that the HTTP request generated by cURL to pass through the Charles Proxy so we can intercept it. The --insecure flag is used to tell cURL to ignore any modification made to the SSL Chain of Trust. As Charles Proxy creates a fake Root Certificate and modify the chain of trust, cURL will know the chain of trust has been modified and stop the request. The --insecure flag is to tell cURL to ignore the modification of chain of trust and let the request pass through. Notice that there is a separator between each of the field (reqtype, userhash and fileToUpload), the separator is the ----------582f7ab074da5615 string. This is called boundary in HTTP terms, this is used to separate different field name and value. The boundary string has to be specified in the HTTP header content-type field. When browsing some website, you might notice that the URL looks like https://example.com?orderID=2&userID=5 , the & in the URL is used to separate the orderID and userID, boundary works similarly. This Stack Overflow Answer explains what is boundary pretty well. The boundary string can be set to any custom string as long as it doesn't appear anywhere else in the raw HTTP request data, so that server won't get confused on where to split the data. As the boundary string used by cURL contains a lot of dashes in front, it might be confusing to explain, I will use another example. Say your chosen boundary string is FLUFFY_ES, you will need to use --FLUFFY_ES (2 dashes padded in front) to separate different field/value. And at the end of the HTTP request, you will need to put --FLUFFY_ES-- (2 dashes in front and 2 dashes at the back) to indicate the end of the HTTP request data. This is according to the specification of HTTP 1.1. The \r\n means new line (like you press the enter key to move to the next line), according to the definition of HTTP 1.1 specification as well (https://stackoverflow.com/questions/27966357/new-line-definition-for-http-1-1-headers). We convert the string into data form using the "string".data(using: .utf8)! method, this will convert the string into data type using UTF8 encoding. We then use the function UIImagePNGRepresentation(image) to convert the UIImage into PNG data form. There you have it! Uploading images in iOS might seem complex at first, but once you understand the concept of boundary and under the hood it is just generating the correct HTTP request for server, it becomes manageable.